Our focus on traditional music from our own Missouri/Ozark region led us to study the events of the Civil War in our own area. With our own local historian and songwriter Bob Dyer we eventually produced the only compilation of music from the Civil War in the West. We recorded two volumes of Songs of the Civil War on the Western Border, Johnny Whistletrigger, and Rebel in the Woods, which include booklets of extensive notes about the songs as well as the lyrics, many of which follow. The war in the Trans-Mississippi West is fascinating and peculiar in Civil War scholarship and a subject often too remote and too difficult for most writers to tackle. The primary sources and certainly the earliest secondary sources suffer from very biased perspectives, causing many a historian and writer to fail in what should be an objective study of what can be called an American Bosnia. A bibliography for our album liner notes can be found HERE. Pictured is a photo of a wax reconstruction of the head of William Clarke Quantrill, the most infamous of the guerrilla leaders in the border war. In addition to giving Frank and Jesse James some on-the-job training for their later outlaw careers, Quantrill played the largest role in the bloodiest and most widespread guerrilla warfare during the Civil War. This theater of war begins years before the firing on Fort Sumter in 1861 and, with the career of James/Younger gang, extends for many years after peace is signed at Appomatox. 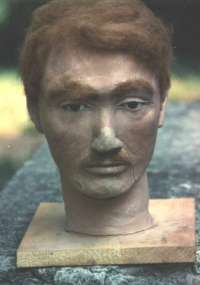 Quantrill’s reconstructed wax head, stored in a refrigerator in the historical museum of his hometown of Dover, Ohio, symbolizes a personal story that is fascinating even after his death. Cathy is a former editor of the “No Quarterly,” the newsletter for the William Clarke Quantrill Society, of group of people interested in studying this perplexing history.